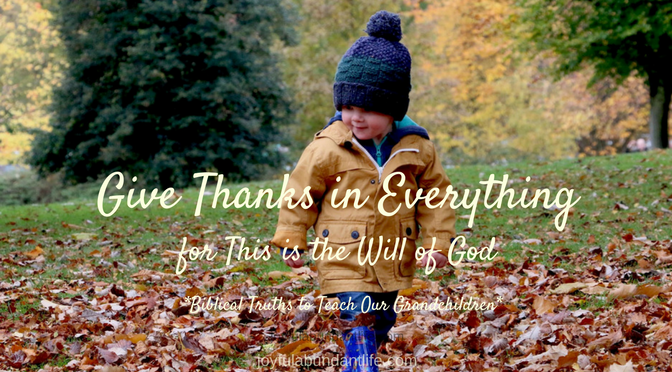 Give thanks in everything (1Th 5:18) is a great truth to be teaching our grandchildren during the month of November. There are often many challenges up for this month to post something for each day of the month in giving thanks to God. What a great challenge! This is a great challenge for any time of the year. As I write in my daily journal, I try to remember to make it a “count your blessings” journal, always thanking God for the blessings of that day. If we do as the song says and count our blessings one by one, it surely will surprise us what the Lord has done. Ask each of your grandchildren to keep a notebook of blessings or praises to God every day for a month. Get together and read them. This would be a great activity to do on Thanksgiving day! Wow! I’m glad I thought of it. I think I need to start this right away. How about you? I am already looking forward to reading what each of my grandkids write down. Another good idea is to challenge your grandchildren to memorize these verses and then recite them together on Thanksgiving day. Psalms 100:1-5 <<A Psalm of praise.>> Make a joyful noise unto the LORD, all ye lands. Serve the LORD with gladness: come before his presence with singing. Know ye that the LORD he is God: it is he that hath made us, and not we ourselves; we are his people, and the sheep of his pasture. Enter into his gates with thanksgiving, and into his courts with praise: be thankful unto him, and bless his name. For the LORD is good; his mercy is everlasting; and his truth endureth to all generations. When we don’t give thanks to God we are sinning. Teach your grandchildren to give thanks TO GOD! Do you see how God is left out of thanksgiving now? There are so many pretty decorations in the store that say give thanks. That’s all fine and good, but teach them that we are giving thanks to someone! True we ought to thank others for what they have done for us, but ultimately our thanks goes to God. Well, I think the Lord wanted us to know how important it is to praise Him and give thanks to Him. Purpose in your heart today that you are going to make it a practice to praise and thank Him everyday for your blessings. This will catch on to those around us and will be a wonderful example to our grandchildren as we seek to instill this Godly truth into their lives. I am posting a series on 31 Biblical Truths to teach your grandchildren. You can begin the series here.